Infancy is a key part of childhood development. Major milestones such as first steps and first words often happen during this time. Almost from the start, babies are interested in play and can benefit from infant play options that help them as they explore the world around them. An infant playground can be a great way to help babies with development. In the first year of life, babies are actively exploring and are going through intensive cognitive and language development. During this stage, babies are also creating close relationships with their parents and those around them and are even experiencing social and emotional development. Infant and toddler playground design are not the same, since infant playgrounds are designed to be used by caregivers and children from 6-23 months. Infant and toddler playground equipment also differs in how they are to be used. Playgrounds for babies are often designed to appeal to smaller infants who are only crawling, as well as older children who may be taking their first steps. The bright colors and textures are designed for early development. A playground such as Infant Play FirstPlay™ Infant Fun Center is engineered with infants in mind. The bright, contrasting colors are ideal for younger infants who are still working on visual development. You can even get this playground in different colors to match your space or the rest of your playground. There are textures on the rounded plastic surfaces so babies can explore with their hands, or can use paper and crayons to explore the patterns. Four separate stations are large enough for caregivers to help or for multiple children to play. A critter-matching panel. Children can learn about the animal kingdom and have fun matching animals. A ball track. This activity can help with fine motor skills by allowing infants to push a ball along a groove. A mirror. Younger infants love mirrors and learn to recognize themselves, building their sense of self. The mirror panel can also help infants with emotional development. Counting and color matching activities. These activities help infants learn basic numbers and colors, helping with cognitive development. A drawing panel. 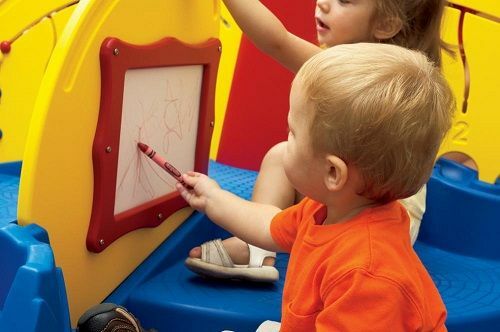 A plastic panel set up like an easel lets infants draw with a crayon, helping them work on fine motor skills and visual development. All panels are made from sturdy plastic. To keep them hygienic for infants, they can be easily removed and cleaned. Designed for safety, fun and childhood development, the Infant Play FirstPlay™ Infant Fun Center lets kids and caregivers play and learn together. Playworld offers a variety of products, including playgrounds for infants, made from quality materials. All our products are designed with input from experts and engineers and are created to exceed all applicable safety standards. With sturdy plastic and excellent artisanship, our playgrounds can help you raise generations. They are inclusive and can support children at all stages of development. For more than 40 years, communities, day cares, schools and other organizations have turned to us when they have needed safe, innovative and well-made playgrounds. Our playgrounds offer infants the chance to have fun, but also are designed to encourage early development to give them a head start on life. Playworld has been helping communities build great playgrounds for more than four decades. We work closely with you to ensure you get the infant playground you want, on time and with respect for your budget. We offer a range of options and can address unique situations, such as small spaces or unusual terrains. If you are ready to create the ideal play area for younger infants, contact us to find out how we can help. Our team would be delighted to help make your dreams of a great play space a reality.